Building LHC Components restores Fermilab to Superconducting magnet prominence. Building components for Europe's Large Hadron Collider has given Fermilab a stake in the next big machine for high-energy physics, and brought Fermilab back to prominence in the field of superconducting magnets. "This project has successfully revived the top-notch effort in superconducting magnet development at Fermilab," said Jim Strait, project manager for the three-lab U.S. collaboration producing LHC magnets. "That's important for the Lab's long-range health, and for the future of high energy physics in the U.S. We also hope to be a model for future international collaborations." Superconducting magnets operate slightly above absolute zero (-273 degrees C, or -452 degrees F), temperatures where some metals conduct electricity with virtually no resistance. Fermilab became the leader in the field with the construction of the Tevatron, the world's first superconducting particle accelerator with its 1,000 superconducting magnets. But in the 1980s, the Superconducting Super Collider was seen as the premier superconducting magnet lab in the U.S., draining resources from Fermilab. 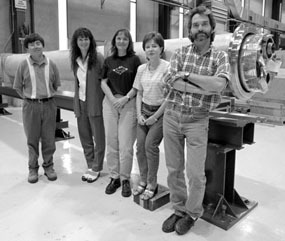 The SSC was laid to rest in 1993, and superconducting magnet development lay dormant at Fermilab until 1995. Then came plans for the LHC, and an opportunity for Fermilab to contribute in one of its signature areas of expertise. But some of the experts had left, and others were working on other projects. "Rebuilding a group of people with real competence in making and designing superconducting magnets has taken a lot of work," said Jim Kerby, project manager for the Fermilab LHC effort. "Technical Division Head Peter Limon has worked very hard at it, and we now have a great team with solid expertise, drawn from all over the world. Walking down the hallway is a real international experience." The U.S. commitment for LHC accelerator and detector contributions to CERN is $531 million over eight years. Fermilab is home for two groups contributing to LHC at CERN, the European Particle Physics Laboratory in Geneva, Switzerland. 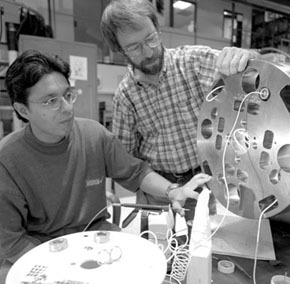 The US/CMS group is building components for the Compact Muon Solenoid detector (see FERMINEWS, April 2, 1999). Kerby's 40-member group is developing and building 18 high-gradient quadrupole magnets for the LHC inner triplets, which provide the final focusing of the particle beam at the interaction points. Fermilab is also responsible for building the cryostats ("thermos bottles" supporting and insulating the magnet cold masses) and for assembling all the inner triplet quadrupole systems, with an additional 18 cold masses from Japan's KEK Laboratory, and corrector elements from CERN. Strait is coordinating the Fermilab effort with those at Lawrence Berkeley National Lab and Brookhaven National Lab. Berkeley Lab is building cryogenic components to connect the Fermilab-built magnets with the CERN cryogenic system, and particle absorbers that protect LHC from the heat energy generated by its own luminosity. LHC will produce about 1,000 times the number of collisions per second as the Tevatron. Brookhaven is building beam separation dipole magnets for the interaction regions and the radiofrequency straight section. With its premier capability for the production testing of cables, Brookhaven is testing all superconducting cables for all LHC magnets. The 5.5-meter focusing magnets being built at Fermilab carry the CERN designation MQXB. Together with the Japanese (MQXA) magnets, their function is equivalent to Fermilab's "low beta" quadrupoles: producing the smallest possible beam "spot," or cross-sectional area, at the interaction points. Because the magnetic field essentially determines the luminosity of the machine, Strait said the MQX's are among the most challenging magnets at LHC. After a rough start, recent successes mean the group is close to wrapping up the model magnet phase, and moving on to prototypes. The models, which take three to four months to build, are full-scale in diameter, containing all the elements of the complex end segments. But they are just 1.7 meters long. They can be suspended on end and immersed in the cryogenic dewar of the Vertical Magnet Test Facility instead of needing individual cryogenic systems. The full-length, instrumented prototypes planned for next year will follow the final magnet design as closely as possible, needing their own cryostats for testing. Kerby expects to begin the final production phase in 2001. The first Fermilab component ready for shipment to CERN is one of the four sections of a 30-meter-long heat exchanger test unit, built for the Lab by Meyer Tool near Chicago. In a critical step, this test unit will verify an inner triplet system design change proposed by the Fermilab group. Because they're so close to the interaction points, these magnets absorb the energy of many more particles than magnets in other locations around the LHC. Fermilab's calculations predicted that the standard LHC heat exchangers weren't up to the job in the triplets. Moving the heat exchanger external to the cold mass enabled a larger unit with a greater capacity. It also added flexibility in the design of the magnet components being built at Fermilab, KEK and CERN. Along with the hardware from Fermilab come many intangible "deliverables" to CERN. Among them: the tooling expertise of the Technical Division's Fabrication Group; testing experience of the Magnet Test Facility; beam physics design support; and the engineering skill to assemble all the inner triplet componentsóquadrupole magnets from KEK and Fermilab, correctors and instrumentation from CERNóinto cryostats from Fermilab, and make sure they work. "We have to tell CERN, `Here's a magnetic field this strong, this pure, at this position,'" Kerby said. "That's what they need to make the accelerator. The hardware around it is what's needed to make that magnetic field. CERN trusts us to deliver the goods, and we will."